What role did the social network play in the merger of two security solutions companies? What were the phases of the launch and the key factors for its success? How has the social network, within just a few months, become the platform for all the company’s internal communications and used by more than 70% of the 300 employees on a daily basis? 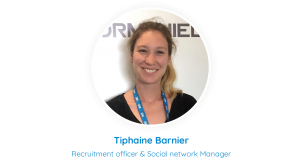 We are pleased to have the feedback of Tiphaine Barnier, recruitment officer and CSR project manager within the HR department of Stormshield. Hello Tiphaine, in a few words, can you start off by introducing yourself as well as Stormshield? I am an associate in the Department of Human Resources at Stormshield. I’m in charge of recruitment – which is my main task – but this is not my only mission. In fact, our HR department has been in charge of the company’s internal communication for a year now in order to allow communication teams to focus on other projects. I’m personally responsible for the deployment and management of a part of this project, which is spearheaded by our HR. We work in a stimulating and growing environment. Last year, we recruited nearly 70 new employees, which allowed us to build a large team of 290 Stormshielders. in a few words, Stormshield is a French company specialized in solutions related to information security. We’re the result of the total acquisition of Arkoon Network Security and NetASQ by the Airbus Group. 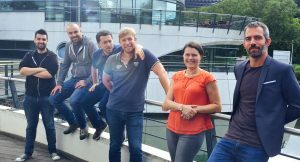 Finally, a last important aspect that characterizes our company is the fact that we are based in 4 different locations in France, with offices in Lille, Lyon, Toulouse and Paris and our collaborators are all over the world because we also have an international team. Is it not rather atypical for an information security company to outsource its internal communication platform? Indeed, we are specialized in the publishing of computer security software and we outsource very little of the applications with which we work. We like to have complete control and are vigilant about data security. 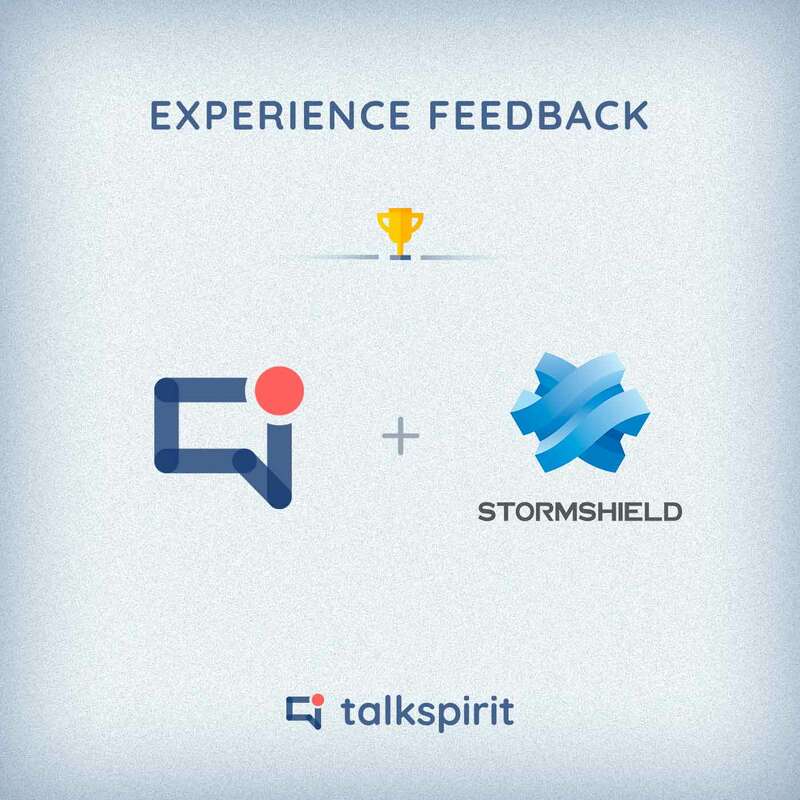 WeAreStormshield (our talkspirit social network) is one of the few SAAS applications we have been working with for several years, as the first project dates back to 2011, and talkspirit also hosts a few client communities for Stormshield. We have had to test their infrastructure to ensure that our security criteria were met. Moreover, all content doesn’t have the same level of confidentiality, sensitive information is not stored on the corporate social network. It’s all about common sense and in-house information management. How did you organize yourself before, and ultimately what led you to launch a corporate social network? When our department took over internal communication, collaborators were confined to their old practices: to put it simply, they emailed massively. As explained in the introduction, Stormshield is the result of a merger, but the collaborators didn’t merge overnight and they continued with their old practices. We had to guide them and it appeared obvious to us that we had to promote a new tool, so we started from scratch and invited all the collaborators to join a new version of talkspirit by flushing the existing communities. Your new corporate social network was helpful through this process? Absolutely. We didn’t have tools to fulfill this purpose before the implementation of talkspirit, not even an intranet network. This tool allowed us to address and quickly gather all employees on a dedicated platform. We were seduced by the solution as a whole, especially by the latest updates made on the latest version which make the solution all the more ergonomic and user-friendly. Being able to create a platform and groups in a simple way and managing all of the settings and configurations from the admin panel also makes things easier for the administrator; the platform is truly turnkey and the launch of the project was streamlined for the administrator. For what purposes do you use talkspirit? To summarize in one sentence I would say that all communication within Stormshield is performed through the platform. This sentence has a strong meaning, but we use it liberally and it’s not obvious to list everything for which the employees use the platform. Everyone has his or her own purpose and there is a group for just about everything. Naturally, the platform is useful for transmitting all our corporate communication to the staff, but we went further. Toolboxes have been created and spaces for sharing documentary resources as well. We have trade groups that have been launched for employees who have the same function but in different locations in France and even around the world. Finally, we’ve created less formal groups, such as the one for the athletes in the company. In the end, the social network is the digital representation of the company; its projects, the work being accomplished as well as the individual personalities of all members. When a new collaborator joins Stormshield, is he or she immediately invited to join the network? This is indeed the case. In several aspects, the platform plays an important role as soon as a fresh recruit begins. First, by consulting a dedicated toolbox on the network or by searching for publications containing the hashtag #newcomer, they can access dedicated content made available to them. Secondly, it’s important for them to introduce themselves to the company at large and to understand the function of all members. To do this, all the employees posted an introductory message after completing their profile and described their journey. This first post is often very friendly and allows everyone to be welcomed with open arms. Finally, access to the profiles and the directory allows new employees to have a better understanding of the environment in which they operate. How did the platform launch go? Did you immediately invite the 300 employees to join the network? No, we paid attention to the preparation of the platform before inviting all the employees, and we also launched a communication campaign within our offices to prepare the employees for the arrival of a new tool. In preparation for the launch, we gave exclusive access to the platform to a group of 20 people. You are probably wondering who this privileged group is? It’s the group of pioneers! We invited representatives of all the teams: marketing, sales, IT, R & D, etc, who were able to post content in the first groups that had been launched. The mission of this group was to take ownership of the tool and to prepare the groups so that the employees could join a platform that was ready and content rich. By launch day, only 4 thematic groups were created in order to share our first content and company information. All the employees then had the freedom to create other groups. In the end, nothing is imposed. Correct… This is our guideline. We have done our utmost to have employees hear about the device, that they adopt it, but they’re free to use it at their will. We do very little promotion with those who only log on occasionally, or teams that don’t have groups. Things are done spontaneously and according to the will of each individual, which strengthens the project. The tool is in the hands of employees who use it as needed. So there is not one group per trade on the platform? Not systematically. Some departments immediately met the need to have dedicated space for their teams but others were content with thematic groups. 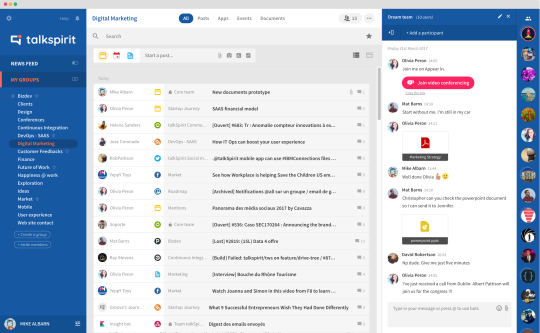 At launch, we didn’t want the corporate social network to become a copy of an organizational chart or of an existing structure. We didn’t want a hierarchy within the roles of member and the groups. As far as I am concerned, I facilitate the public groups but my function stops there. Once the platform was ready, who managed employee invitations? I was in charge of inviting the staff. This phase can be frightening but in fact it was very simple and no assistance was necessary. I did a copy-paste from the list of email addresses in the admin panel. Even with hundreds of names, the user invitation process on WeAreStormshield actually takes only a minute, and we can easily register employees to groups created beforehand. What did you observe at the launch and during the following months? The discovery phase was nice. We felt that the project attracted a lot of interest from the very beginning. Employees quickly grasped the tool, began “paying with it” and proceeded to do some tests, then to create groups. I think that it’s possible to explain this: on the one hand, the popularity of the project is due to the large number of computer scientists employed at Stormshield. It’s “geeks” who enjoyed playing with the platform the most. On the other hand, our promotional efforts that were made at the launch of the project also contributed to its success. We did a teaser in the form of posters as well as contests to pique the curiosity of the employees. In the end, our employees were ready to welcome the platform… They even chose its name! Once the launch was over, we entered a new phase during which we had to answer questions and appease our staff. They were looking for clarity, it was necessary to convince and explain to them the purpose of this platform. The questions they ask may seem simple but they make sense. This allows them to better understand what the tool is used for, what type of content they can post, how safe it is, and so on. Then, 6 months after the launch we observed that everything was clear and that the platform was used by the majority of our employees. We then decided to probe them in order to know what they thought of the tool and to give them the opportunity to have the last word as a way to definitively validate the project. Indeed, we didn’t want to commit ourselves from the beginning and used talkspirit’s monthly plan which allows to terminate the service after a month. What emerged from this employee survey after 6 months of use? Some have claimed to having difficulty getting used to working with a newswire and are complaining that the information is less structured and that they are getting lost in the huge volume of information. Do you have statistics to share about the rate of participation? The network is one of the essential tools for employees today, and it’s completely driven by usage. The numbers regarding usage are excellent! All employees have joined the social network, and more than 70% of them log on everyday. Thanks to these statistics, we can now actually say that our social network has successfully killed the use of email between employees. What are the main difficulties you have encountered in reaching such a result? Reassuring employees at the launch and encouraging them to complete their profiles. This is very important because we use the platform as a trombinoscope and if everyone doesn’t play the game, it makes things more difficult. Also, I would say encouraging employees to post in English, so that all employees including the ones abroad will want to join the platform. We try to post as much as possible in English in open groups. Have you used any support services provided by a consulting firm or a talkspirit project manager during the launch phase? Not at all. The launch of the social network was entirely managed in-house. I’m the employee dedicated to the animation of the platform and we relied on a group of “pioneers” at the launch. We managed everything independently and didn’t require any advice or support. However, talkspirit is easily reachable. It offers quality customer support and we enjoy a genuine proximity with them. They provide dedicated online support for all our users who are free to communicate their ideas, needs or bugs directly to the team. As a project manager, this allows me to be focused on the essential requirements for the project launching, to manage the groups and to monitor the platform. What is the community that works best? This is our corporate group, where there is the most information sharing. Newcomers introduce themselves, all the news is shared (success stories, product launches, highlights …) Simultaneously, the Stormshielders themselves created many confidential groups for their projects, and they can also be very intense because all project communication passes through this channel. Your feedback is very positive. How do you think you’ll use talkspirit in the future? I would like us to use talkspirit more thoroughly. There are new features to take advantage of that we don’t use yet. I am particularly thinking of the possibility of integrating business applications such as Salesforce, so that our sales teams become an integral part of the social network, or to talkSpirit integrated videoconferencing connectors that we could use more. Following this successful launch, what is one good practice that you would like to share with those who want to get started? I think the most important factor is to get things right and to prepare your launch the best you can. The event shouldn’t look rushed and the teams must mobilize around the launch of the social network. I would also add that it is important to choose someone which will be responsible for hosting the launch… This helps greatly. It doesn’t have to be a team; for a project of 300 employees, it is not useful. But clearly identifying a facilitator is essential. 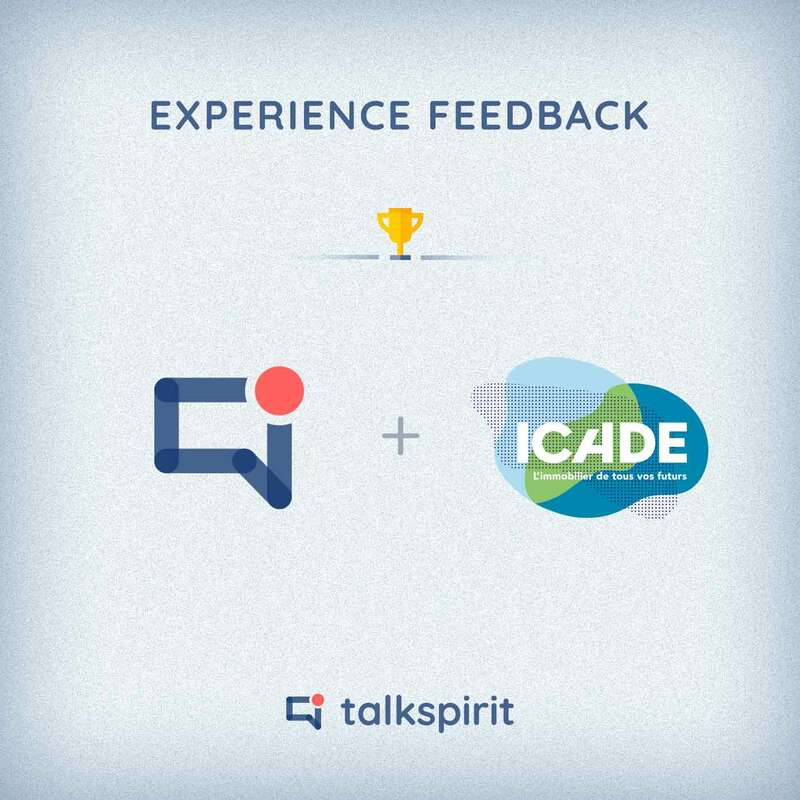 Last question, to whom would you recommend talkspirit? To multi-site companies. 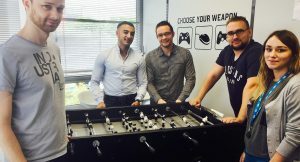 WeAreStormshield is a great tool for us, because it creates a “shared digital desktop” by all employees. 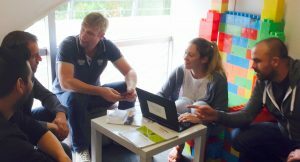 All our teams access information and trade groups to interact with each other, even if they are scattered through our various locations in France. This article is part of a series focusing on to the good practices to be adopted for the launch and implementation a collaborative platform or social networking within a company or organization.